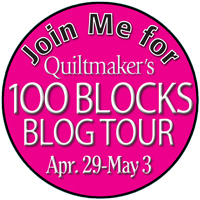 Quiltmaker's 100 Blocks Blog Tour and a Giveaway! 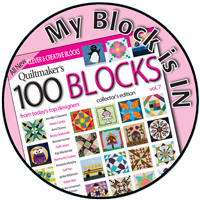 Hellooooooooooo and welcome to Quiltmaker's 100 Blocks Blog Tour! I am down right excited to have my block in this magazine! To be included in a group of so many talented and wonderful designers is truly an honor. A big thank you to June, Carolyn, Diane and Shayla for being so nice to correspond with. These ladies do an incredible job of putting this magazine together. This is a magazine that is not only fun to collect, but it's also a keepsake for your inspiration library. Of course, you know my block had to be about bunnies. ;) I named it "Carrot Run." "Sure would be nice if Mama would run and get us some carrots!" This 12" block features National Nonwoven's wool felt. I used Navy (magazine says black, but it's actually navy) Butternut Squash and Reets Relish. I also used Valdani's 3 strand floss from my Folk Art Fusion (TM) collection. What's really fun about this magazine is that you can take any of the 12" blocks and create something of your very own. I decided to turn my block into a 16" pillow. I had some Harvest Moon fabrics from Kansas Troubles which I love and wanted to use. I made this pillow to donate for an auction at The Rabbit Haven in California. 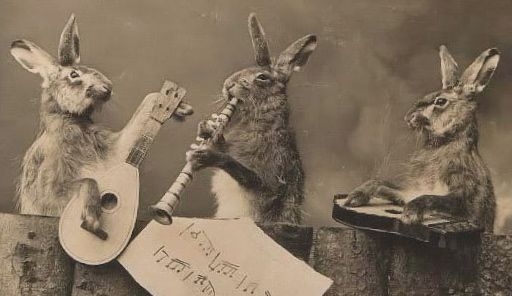 Their annual BunnyFest is coming up in which they raise funds to support the rescue, as well as, provide education on rabbit care to families who adopt these precious creatures. This is an all-volunteer rescue and I am very happy to help them. So, what will you be inspired to create from all the fabulous blocks featured in this issue? The magazine will be available on newsstands around May 7th. I will also have some copies for sale in my SHOP. However, you know how much I do love giveaways! 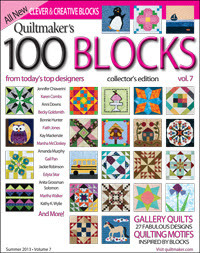 The fabulous folks at Quiltmaker will be giving away a copy of this magazine! To enter, simply leave a comment on this post. The bunnies and I will use the random number generator to select the winner this Friday, May 3rd. As always, we love our friends/followers so if you are signed up (right sidebar) as a follower, you will get two chances. Good luck! Bunny ears crossed! Now I invite you to hop over to Quiltmaker's, Quilty Pleasures, Blog and visit with more of the designers and enter their daily giveaway. Tell them we said hello! "Hey Hannah! Did you hear? I'm famous!" "What do you mean you're famous?" "You know our bunny friend, Maple, over in the UK? Well her Mama and Papa, Jen and Derek, were shopping in the grocery store and came across this!" 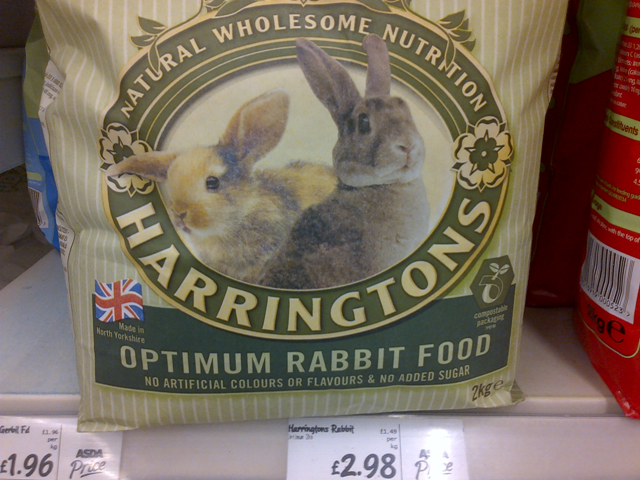 "My very own brand of bunny food! How cool is that!" "Oh brother. You've got to be kidding me." "Jealousy will get you nowhere Hannah." Hoppy Friday! 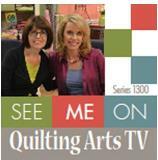 Please join us Monday for Quiltmaker Magazine's 100 blocks tour! Have a fun, creative and very happy weekend. Hi ya! I hope you are having a fun week so far. Me and the bunnies have been having lots of fun. First, is a little sneaky peeky of the "Carrot Run" block. See the post below for more info. I'll show you the whole block and what I did with it on Monday for the blog tour. So fun! 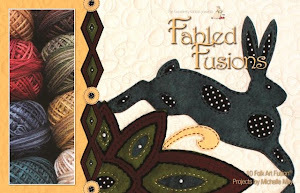 Next is a sneaky peeky of another project which will be in my Fabled Fusions book. This piece is called "Wish Upon a Star." As you know, I listen to music all day long. Music makes me happy and soothes my soul. 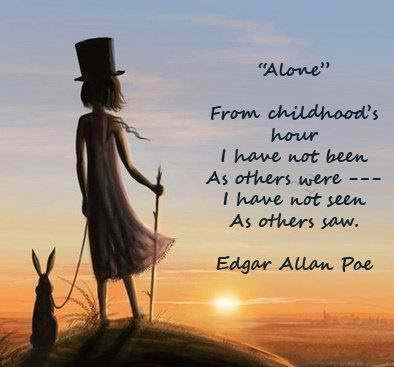 It also inspires me as I get lost in the melodies and words. I'm a dreamer for sure. This is the song that inspired this piece. I loved to watch Disney on Sunday nights when I was very little. I loved the magic. "When you wish upon a star, makes no difference who you are. Anything your heart desires will come to you. If your heart is in your dream, no request is too extreme. When you wish upon a star as dreamers do." Make some wishes and dream some dreams. We'll see you back here on Friday. Hellooooooooooo! How are you? Did you have a wonderful weekend? It's been busy here in Bunnyville. Some days I just don't know know where the time goes. I'm sure you can relate. Today I want to share some very exciting news with you! Many of you know this wonderful magazine. So many fun blocks and ideas. This magazine is really fun to collect as you always have lots of blocks to inspire you. Well, I am over the moon excited to tell you that I have a block in the upcoming issue! This issue is due on the newsstands May 7th! Happy Bunny Dance! The name of my block is called, "Carrot Run." You already know there are bunnies don't you? hee,hee,hee. 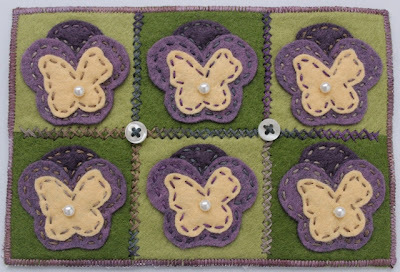 It is a wool applique block. I invite you to join me here next Monday, April 29th for a blog tour. I will show you my block and there will be a link back to the Magazine with some of the other fabulous designers. There will also be prizes! Woo hoo! 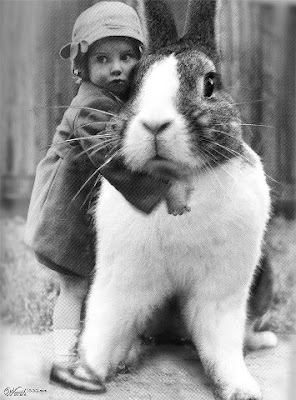 Well, I'm off to Bunnyville. I'm working on a new Folk Art Fusion (TM) piece. Hop back here on Wednesday for a mid-week sneaky peeky and some fun music. Hoppy Friday and a Winner! Harrington here to announce the winner of the Mid-Month Madness giveaway. This month, the random number generator selected #64, which means Beth from Add a Pinch is the winner of the Purple Pansy Postcard and Missie's pattern. Woo hoo! Please send us an email with your mailing address Beth, and we'll get your prize to you right away. We only have 6 kits left if you would like to purchase one. Once they are gone, that's it. In closing, there is so much tragedy in the news this week and we have so many friends that are hurting, sick and going through hard times. We send light, love and prayers to you. "Dear God, please shine your light on all those who need love at this time. Amen"
See you back here Monday with some happy news. There have been lots of bee's flying around Bunnyville. Here's a sneaky peeky of my Barrington Bee's. I made five different drawings of bee's before I finally decided on this one. I can't wait to show you more and I have some exciting news to share next week! I will leave you with this today. Willy Wonka & The Chocolate Factory was always one of my most favorite movies as a child. Funny how you can get so caught up in bills, responsibilities, etc. and forget things that made you really happy. The simple things. The act of dreaming and getting lost in your imagination. I've always had an overactive imagination. It helped me escape from sadness and pain as a child and in many times as an adult. I think we all need a little escape. "There is no life I know to compare with pure imagination. Living there you'll be free if you truly wish to be. Having you here to share in the adventures of my imagination is such a gift. "Hold your breath, make a wish, count to three. 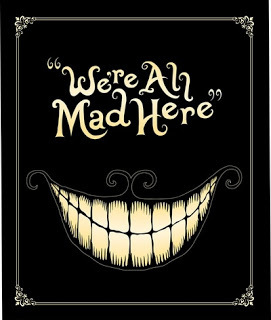 Come with me and you'll be, in a world of pure imagination." Don't forget to leave a comment for the giveaway on the post below. See ya Friday! It's time! It's time! 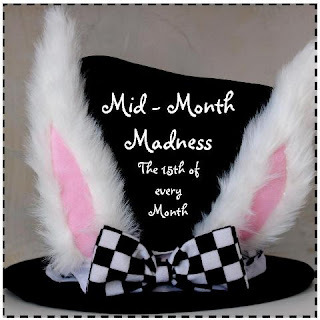 It's Mid-Month Madness and a Giveaway! First, I would like to show you my Purple Pansy Postcard. After such wonderful feedback last month, I decided to continue on each month with these postcards. They are quick and easy to make and are truly addicting. I was inspired by these pansy baskets in Captain's yard. They are so pretty. My favorites have always been the purple pansies with the yellow centers, so that's what I designed. 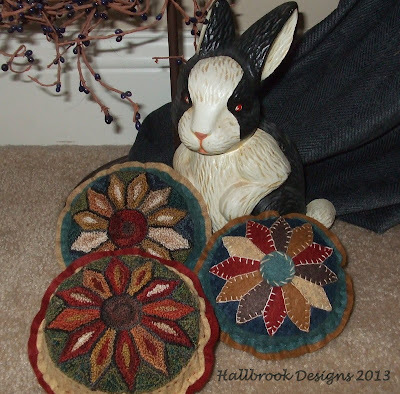 The pattern is FREE, but the bunnies and I truly appreciate all your help and support. Every month we donate some of the money from sales to rabbit rescues in the US. So, when you make a purchase from us, you are not only getting something fun for yourself, you are also helping bunnies in a rescue. Thank you so very much! We have 15 kits available. Each kit is enough wool, fabric, floss, buttons, pearls, fusible, index cards and even clear, plastic, mailing envelopes to make two postcards. You can keep one and share one. There will only be 15 kits, so if you want one, Hop over here to get the pattern and to purchase a kit. Next, I would like to introduce you to my dear friend and fellow Valdani thread designer, Missie Carpenter of Hallbrook Designs. Valdani brought Missie and I together and she is one of those friends I can't wait to meet in person one day. I have seen her beautiful punchneedle designs up close and I simply adore them. 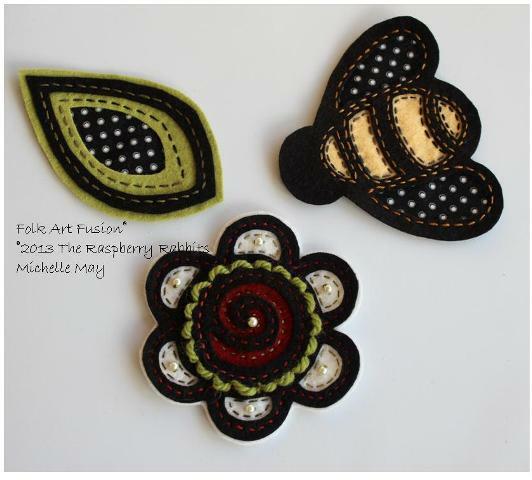 Missie designed these beautiful Sunflower punchneedle and wool applique pincushions using my Folk Art Fusion (TM) 3 strand floss collection. I think they are gorgeous. 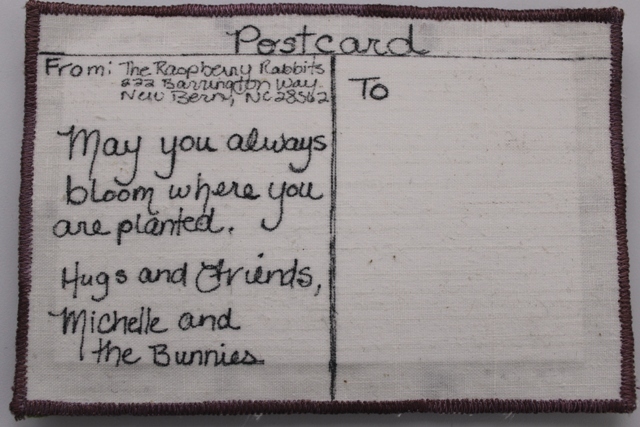 I invite you to Hop over and visit Missie's shop for this pattern as well as many other incredible punchneedle/quilting designs. You can purchase the floss collection from me here. Ok, so are you ready for this months giveaway? Woo hoo! 2. If you are signed up as a follower (right side bar) you get two chances. 3. You only need to leave one comment. You can say you are a follower in that comment. Please note, I do check to make sure you are signed up. I've had some cases where folks were fibbing. (naugty, naughty) That's not fair to others, so if I don't know you very well, I check. Fair is fair. Harrington and Hannah will use the random number generator to select the winner this Friday, April 19. Good luck and happy stitching! We'll see you back here Wednesday for a mid-week sneak peek. Much to do, much to do. 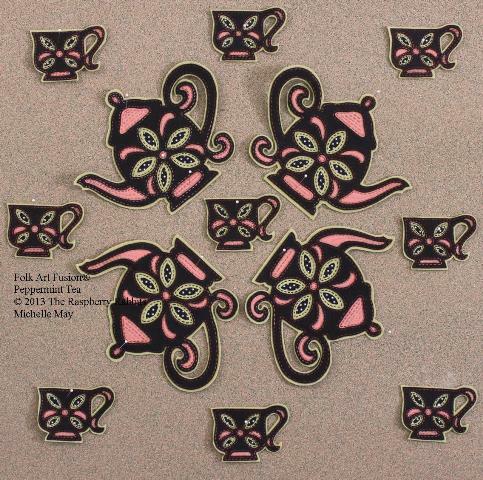 First, I want to share another sneaky peek of the progress of my "Peppermint Tea", Folk Art Fusion quilt. It's hanging on my design wall waiting for the next step which is auditioning background fabrics. Way too much fun! "Hi! Hawwwingtwon hewer to wemind u..."
"Harrington, it's not polite to talk with your mouth full." While Harrington finishes his snack, I will remind you to join us Monday for Mid-Month Madness! After all the wonderful feedback last month, I decided to continue with another FREE post card pattern and a few kits for sale. Kits will be a limited number, so if you want one, hop over early. 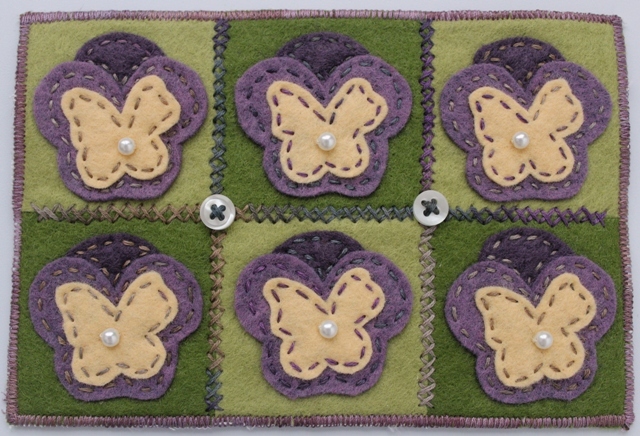 We will also be showing you a new punchneedle pattern designed by our friend, Missie Carpenter, of Hallbrook Designs. 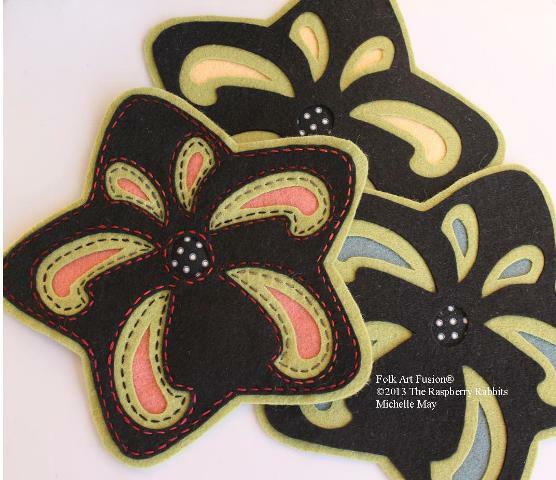 She used my Folk Art Fusion 3 strand floss collection to create the most charming pincushions. Are you linked up with our friend, Carrie Pippins, of a Passion for Applique, for completing your UFO's this year? If you are, the prize this month is a $20 gift certificate from our shop! Woo hoo! Well, that's about it for this day. It's going to be a busy weekend here in Bunnyville. Lots to do. Lots to do. "Me neither. It's the weekend!"